The BMW X3 xDrive30i is powered by a 2.0-litre, four-cylinder turbo-petrol engine, which is also shared with the BMW 3 Series and 5 Series, which makes 252 hp and 350Nm of torque. Equipped with an eight-speed automatic gearbox and the xDrive all-wheel-drive system, the new BMW X3 SUV sprints from 0 to 100 kmph in just 6.3 seconds. The petrol-engined BMW X3 is offered in the Luxury Line which comes with 19-inch alloy wheels, chrome grille, Vernasca leather upholstery with contrast stitching and wooden trims. The company is also offering the BMW Display Key with the new BMW X3, besides welcome light carpet, rearview camera with park assist, and wireless charging. The petrol motor gets auto start-stop function, brake energy regeneration as well as four driving modes such as ECOPRO, COMFORT, SPORT and SPORT+ to suit diverse driving conditions. “The BMW X3 model has been extremely successful. With the launch of the all-new BMW X3 xDrive30i, now our customers can also experience unadulterated driving pleasure in a refined petrol engine option,” Vikram Pawah, president at BMW Group India, said. He said with cutting-edge BMW TwinPower Turbo technology at its core, this engine spells power and performance. 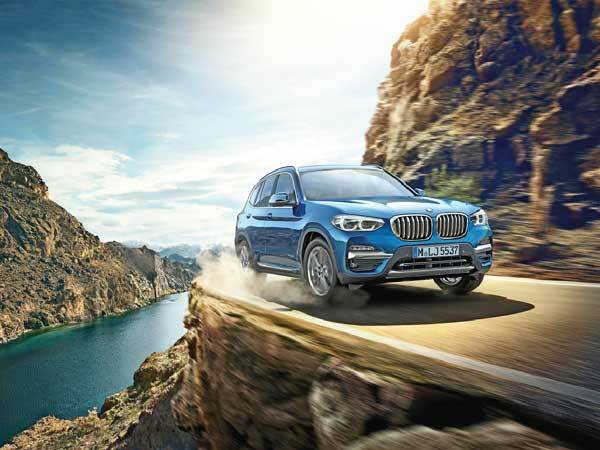 “The xDrive technology in the BMW X3 ensures unhindered progress, not only when travelling along rutted gravel or sand tracks, over the churned-up ground or in deep mud, but also on city roads with high-speed bumps,” Pawah pointed out. Thanks to its new underpinnings, the new BMW X3 is significantly stiffer and around 55 kg lighter than its predecessor. While it retains the same overall dimensions, the wheelbase on the new BMW X3 is longer, which helps liberate more interior space. Compared to the second-generation model, the new third generation BMW X3 model’s interior has been significantly updated. The in-cabin technology is shared with the BMW 5 Series, which includes the touch-and-gesture-controlled iDrive infotainment system, a head-up display and 360-degree cameras. BMW has also packed a host of safety features, including six-airbags, attentiveness assistance, dynamic stability control (DSC) including cornering brake control (CBC), electric parking brake with auto hold, side-impact protection, electronic vehicle immobiliser and crash sensor, and ISOFIX child seat mounting. BMW is expected to introduce a 360 hp, 3.0-litre twin-turbo petrol engine in the M40i, which would compete with the likes of the Mercedes-AMG GLC 43 Coupé in India on power and price and a 265 hp, 3.0-litre six-cylinder diesel motor in the xDrive30d, at a later date.